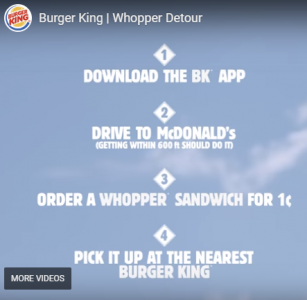 Burger King has a $0.01 Whopper when you order at McDonalds using the Burger King App. $4.49 for 3pc Nuggets plus 1 Large French Fries. Code: 8753 At participating locations. Not valid in PR, AK, HI or outside US. $4 2 Bacon Cheeseburger, 1 Small Classic Fries, and 1 Small Fountain Drink using Code: 9410. At participating locations. Not Valid in PR, AK, HI and outside US. $3.49 Chicken Fries & 1 Large French Fries Code: 9639 At participating locations. Not Valid in PR, AK, & HI or outside US.